ANUVAHOOD is a beautifully observed, wickedly funny satire on British "yoot" culture, as depicted in flicks like KIDULTHOOD. Writer-director and lead actor Adam Deacon takes us into the council estates of contemporary London, and gives us the unforgettable character of Kenneth - a nice boy from a nice family who thinks its cool to pretend to be a gangster-rapper from Baltimore. All talk and no action, the boy spends the first hour of the film talking in a nonsensical patois that's more Ali G than The Wire, hanging out with his mates, having zero luck with the ladies and getting picked on by the camp bully, Tyson. Just as you start crying out for something to actually happen, the movie lurches towards the semi-serious, with Kenneth selling drugs to save his family from the bailiffs. The movie doesn't really survive this abrupt tonal shift, although the skits shown during the credits help to restore the day-glo comic-style comedy of the first hour. The film is well put-together - very assured for a directorial debut, and I very much liked the cinematography from DP Felix Wiedemann. In particular, in the goofy early scenes, hardly any dialogue is shown in two-shoots - rather we flip back between PoV shots in a cartoon-ish manner. Adam Deacon, Femi Oyeniran and Jazzie Zonzolo are incredibly funny as the useless teens, although I found Richie Campbell as Tyrone too broad. There are choice cameos from Paul Kaye; Levi "Reggae Reggae" Roots; the self-parodying Aisleyne of sometime Big Brother fame; and Linda Robson. But best of all, we get a very tongue-in-cheek turn from Richard Blackwood as "Laimbsury's" manager, Russell. I loved the irony of Russell telling "K" that his music career won't go anywhere, as well as later references to Ashley Walter's flick 4.3.2.1. 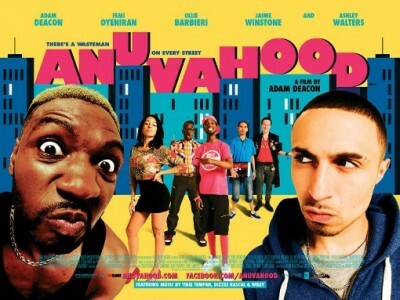 Overall, ANUVAHOOD is definitely funny enough to justify a cinema ticket, and while I didn't buy in to the tonal shift in the third act, there's something cheering about the fact that British teen flicks are established enough that they warrant their own spoof. Not to mention the ultimate message that it's better to just be yourself than to aspire to be some dickhead pot dealer. ANUVAHOOD is on release in the UK.